Episode 96 has arrived after an unexpected month long hiatus! John and Dixon join me in the Gamers Lounge studio for a host of talk, some story time, and then more talk. We open up with our typical intro, covering what we have done for the past month. This turns into a fairly intense talk about Relic Knights wrapped in a little rambling. After that John gives a reading of the Winning story from the Mystery Battle Report Contest. Thank you Xander for a great battle report. Our topic was set to be a short discussion of more Relics Knights, specifically about playing 70 point games vs 50 point games. We dive into that but also give a couple tips on playing relics knights that we have picked up so far. That brings us to the second story, where Dixon gives a dramatic reading of the runner up battle report. Thank you Paul, I hope Dixon does the story justice. Then we try to put together a short outro to sign off. This turns into a ramble about Wrath of Kings and a few other games that are incoming in the next couple months. This episode has Bill and John discuss Kickstarter. The guys go through the projects they have backed on kickstarter, why they backed them, and what their experiences have been. Following that the No Gamer Left Behind book review segment returns. Carl and Bill join forces to review Ready Player One. I occasionally carry a camera in my gaming bag with the intention of taking pictures to record games for battle reports. I was browsing through that camera today and came across some pictures from a battle I took at some point in the past. I cannot remember everything that happened during the battle, but the pictures looked like fun. As such, I thought there would be a fun contest involved here. Here is the deal. I have posted the 7 pictures from the Wild West Exodus battle report below, in the order they were taken. They map out events in a game. 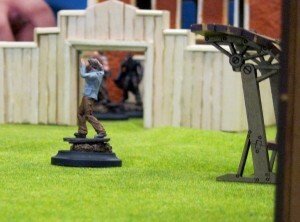 I am asking you, the listener, to write up a narrative battle report using these pictures in the order they come in. I will post the stories here and on the Wild West Exodus boards for public voting. The author of the favorite story will have that story read on a future Gamers Lounge recording in addition to receiving a $20 WWX gift certificate. Please email entries to bill@gamerslounge.coda.net with the subject “Mystery Battle Report”. Make sure to annotate within the story where each of the 7 pictures should go in the narrative. Contest will run from July 1, 2014 through Midnight US EST July 31, 2014. Voting will be posted to the WWX forums for a week starting August 1st. I will announce the winner in the first Gamers Lounge show following August 9th, 2014.